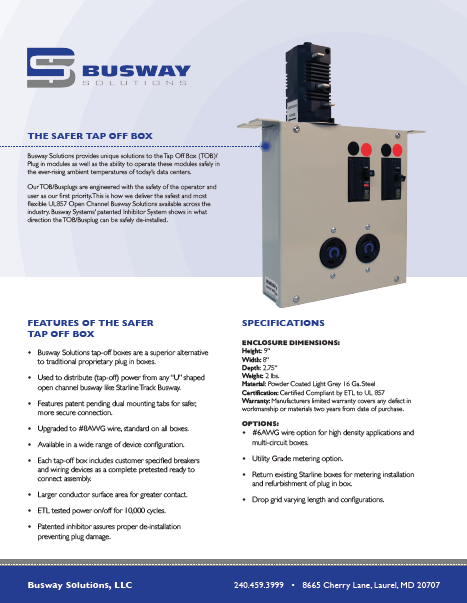 Busway Solutions provides unique solutions to the Tap Off Box (TOB)/Plug in modules, as well as the ability to operate these modules safely in the ever-rising ambient temperatures of today’s data centers. Our TOB/Busplugs are engineered with the safety of the operator and user as our first priority. This is how we deliver the safest and most flexible UL857 Open Channel Busway Solutions available across the industry. Busway Systems’ patented Inhibitor System shows in what direction the TOB/Busplug can be safely de-installed. #6AWG wire option for high density applications and multi-circuit boxes. Return existing Starline boxes for metering installation and refurbishment of plug in box. Drop grid varying length and configurations. 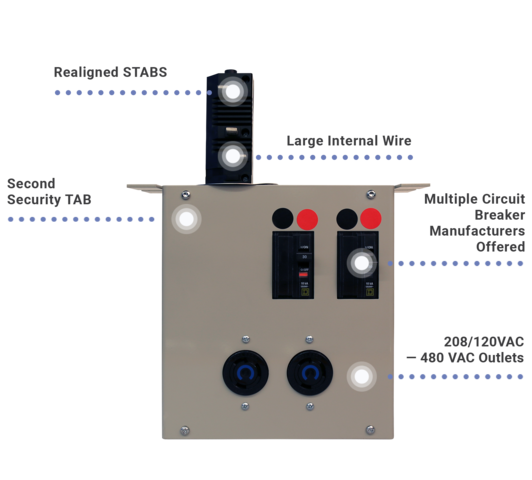 Busway Solutions is committed to bringing to market products that will make the TOB/Plug in boxes safer for the IT operator, provide the ability to support higher density loads, and give relevant information to increase the reliability of the Power Distribution System. Allows for the flexibility to add or replace server racks and its size leaves room for additional equipment. Easily supports new or rearranged assembly lines without the cost of altering the existing infrastructure. Provides a quicker, more cost-effective installation and repositioning of equipment. Our mission is to provide the most robust and safest overhead open channel busway system for the IT Operator. 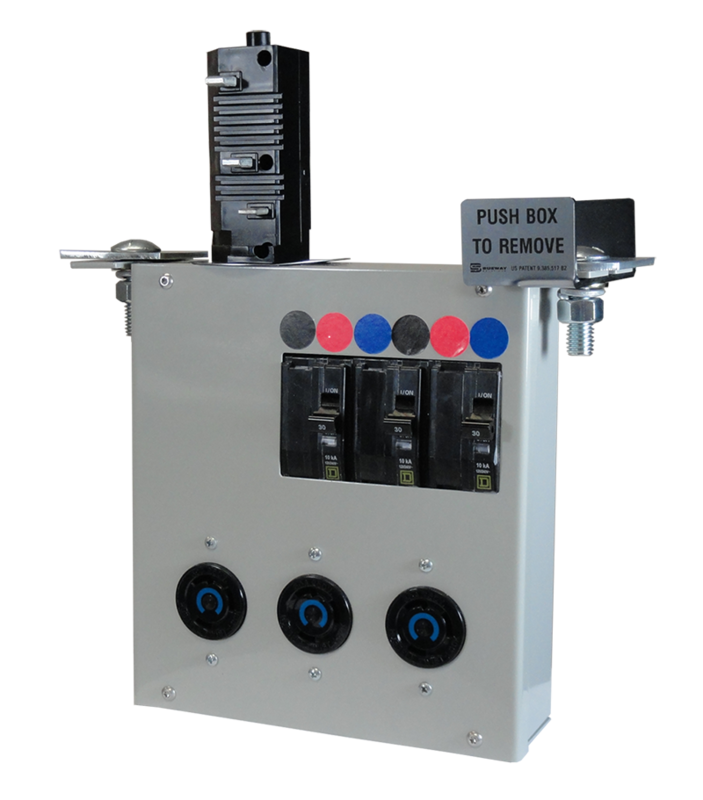 Our passion is to constantly review and improve all busway manufactures systems by providing unique solutions to the Tap Off Box TOB /Plug in modules. 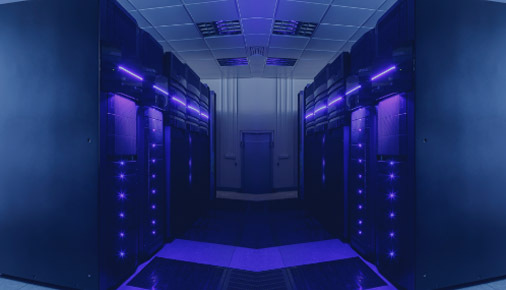 This includes the ability to operate these modules in the ever-rising ambient temperatures of today’s data centers. Busway Solutions, LLC was formed by two individuals who share this passion to constantly improve the busway experience. Eric Shatzer is responsible for the operations of the company. 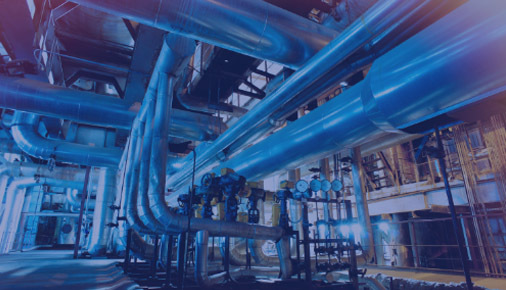 He brings more than 25 years of experience in the Installation of critical power systems, from small data centers to supporting numerous FAA radar installations. Eric’s experience working with electrical systems has been critical to the success of the TOB/Plugin boxes, as he brings knowledge of proper wire sizing, circuit layout and code compliance. He has witnessed the migration of power distribution from wall mounted panels, to Power Distribution Units (PDUs) with underfloor cabling, to overhead open channel busway. The second managing member is Mark H. Baldwin, who is responsible for sales and ongoing patent management. Mark has been in the business of supporting critical loads for more than 30 years, and he holds numerous patents for overhead busway. Patents include the use of 380VDC in overhead busway, a safety circuit that informs the IT operator that power has been removed from the output of the TOB/Plugin box, and an Inhibitor device that reduces the risk of improper de-installation of a rotational style busway Plugin module. Mr. Baldwin has been credited with placing the first overhead busway for supporting critical loads in 1999 with AOL. “Open Channel Busway is UL 857, finger safe and good for up to 600VAC or 600VDC,” Mark says. “This provides for the most efficient and flexible power distribution system.“ Furthermore, UL 857 busway can accommodate 208/120VAC, 400/415VAC and for truly High-Density loads, 380VDC. Busway can be easily changed in the field to support these three popular voltages. This cannot be done with existing panelboards. Busway Solutions is committed to bringing products to market that will make the TOB/Plugin boxes safer for the IT operator. 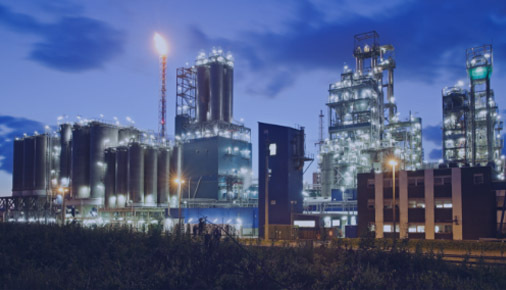 Our products provide the ability to support higher density loads, have safety features that make it safe to de-install a TOB/Plugin Box, and give relevant information for the IT operator to increase the reliability of his Power Distribution System. Why is your Tap off Box (TOB) better than the competition when using a U-shaped open channel busway? The Busway Solutions Tap off Box (TOB) has 2 security tabs, which assure that any mechanical load is taken off of the electrical mast. A TOB with only one support has the electrical mast supporting the plug-in. This design places stress on the electrical stabs located within the mast. All BS, LLC TOBs have two supports, to assure that the electrical mast is not supporting a mechanical load. What wire size is used in the electrical mast to feed your TOB? Busway Solutions provides a #8A WG wire as our standard. Optional wiring can be #6 AWG and #4AWG. We recommend these wires for high-density loads and TOB with multiple circuits. Be careful, as our competition uses #lOAWG wire as their standard. Why is the Inhibitor used? Busway Solutions has a rotational style U-shaped open channel design. The Inhibitor is placed on the outboard security tab upon installation. The signage will tell a future operator which direction to rotate the TOB/plug-in, thereby avoiding damage to the base of the electrical mast. Why is the Busway Solutions TOB easier to install/de-install than other plug-in modules? Our design team evaluated our competitions' design and found that a realignment of the electrical stabs allows for a smooth insertion operation and matches with our patented Inhibitor --providing a safer working device for your IT personnel. What kind of metering do you provide? Busway Solutions provides three levels of metering to match your requirements and budget. Our most popular is Trend Point due to its vast capabilities. We can provide Real Power Quality (PQM) metering, including Waveform capture! Will using Busway's TOB cause injury to my employees/ subcontractors? Our engineering team designed a better box using strong material in the mast, the largest surface area on our stabs, and the correct wire size to carry your loads. We are ETL listed in our competition's U-shaped channel and have been rotated 10,000 times in and out of the channel under load (we do not recommend removing any TOB under load for any circumstance). We believe that our box will keep your user safer because of our design, two security tabs, correct wire size and our patented Inhibitor. All Busway Solutions TOBs carry a 2-year warranty. We extend this 2-year warranty to the Busway Bar Section that the TOB is inserted, even if the Bar is 5 years in use. We require that the Inhibitor is installed in all existing plug-in modules to receive this 2-year warranty. For more information, please complete out the form below and a Busway Solutions representative will contact you. You can also feel free to call us at (240) 459-3999.